An ancient martial art form practised by members of the pig family. Similar to the other animal styles of Kung Fu, but developed for porcine rather than to mimic them. This style is characterised by moves such as razorback and brick house. 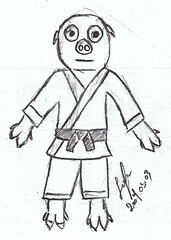 This entry was posted in Humor, Words and tagged kung fu, pig, swine. Bookmark the permalink. One of the most famous exponents was Ham Hok.